Over a year ago, I created and shared a set of Christmas Titles and Fonts along with a set of digital cut files. After spending a lot of time recently designing Christmas themed products and projects I was inspired to put together another set of some of my favorite fonts along with a set of digital cut files and share them with you as a bit of an early Christmas present. Just like the original Christmas Titles and Fonts you will find the link to the fonts I used below. Some of them are free and some of them are not free. 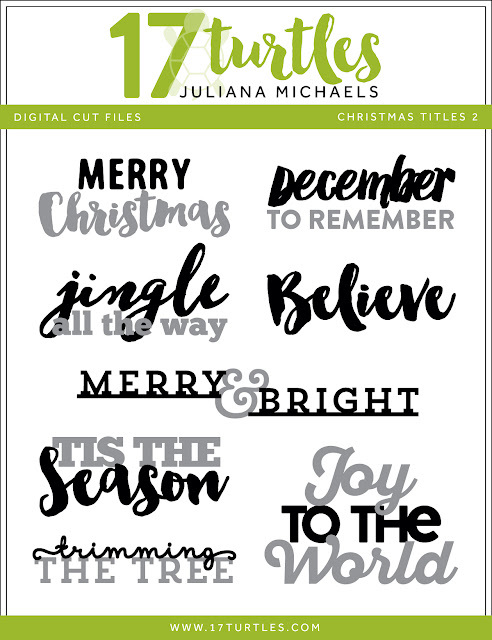 For those of you who don't want to buy the fonts, I have you covered with a digital cut file I created that you can download and use with your electronic cutting machine. I hope you enjoy this Christmas titles and font share, as well as the digital download. Merry Christmas! Hey Juliana...as usual, I think your fonts are amazing....& I've downloaded them. Maybe, just MAYBE this time I might actually use them, LOL.....one can but hope;)!!! THANK YOU either ways:)!!! Oh Juliana these titles are fabulous, just perfect mix! Thank you so much for the freebie! thank you,I love the fonts you have used! Thank you for the freebie cut files....perfect timing as I am getting ready for a weekend retreat! Thanks Again!!! These are awesome! Thank you!! FANTASTIC! Thank you so very much and Happy Holidays to you and yours. These are wonderful! Thanks for sharing with one more artistically and technically challenged! Happy Thanksgiving!